Size: Male and female harp seals are similar in size with adults averaging 1.6 m in length and weighing 130-150 kg. Feeding habits and impact on the ecosystem: Harp seals eat a varied diet of fish such as capelin, Arctic cod, herring, sculpin, Atlantic cod, Greenland halibut, redfish, and plaice. They also consume crustaceans, shrimps and prawns. DFO has conducted numerous studies on seal interactions, which evaluated the effects of seals on fish stocks. 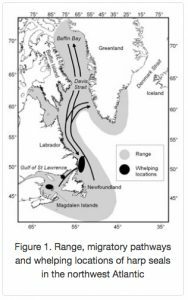 These results suggest that harp seal predation is not a significant factor in the lack of cod recovery to date, and that cod recovery is being affected by low productivity associated with low capelin. In the northern Gulf of St. Lawrence, the lack of cod recovery appears to be driven primarily by environmental conditions, followed by fishing and harp seal predation. Reproduction and life cycle: Females bear a maximum of one pup per year, between late February and mid-March and require stable ice for giving birth and rearing their young. Newborn pups weigh around 11 kg and are 80–85 cm long. They are nursed, on average, for 12 days and gain over 2.2 kilograms per day. Once the pups are weaned, the females leave the ice to mate. The pups begin to moult their whitecoat at around 10 days old. By three weeks of age they have completed their moult and are referred to as a ‘beater’ because of the way in which they swim. Distribution: Harp seals are restricted to the north Atlantic where they are separated into three separate populations, each of which uses a specific pupping site. The Northwest Atlantic stock (Fig. 1), which is the largest, is located off eastern Canada and western Greenland. This population is further divided into three separate herds based on the breeding location. The Front component breeds off the coast of southern Labrador and northern Newfoundland, while the Gulf herd breeds near the Magdalen Islands in the middle of the Gulf of St. Lawrence. A third, smaller group may be found in the northern Gulf. A second stock, the Greenland Sea, pups off south east Greenland while the third stock (White Sea/Barents Sea) pups in the White Sea, in northern Russia. Population trends: The Northwest Atlantic harp seal population is healthy and abundant with an estimated population of 7.4 million animals, almost six times what it was in the 1970s. There is some evidence to suggest that the Northwest Atlantic harp seal population may be reaching levels close to its natural carrying capacity, which is the maximum number of individuals of a particular species that can be sustained by that species’ ecosystem. The harp seal population has remained between 7.0 and 7.8 million since 2004. This is thought to be due to a decline in herd productivity, which is probably related to food resources. Variable juvenile mortality, related to poor ice conditions, particularly in the Gulf of St Lawrence between 2010 and 2013 may have also contributed to this lack of increase. However, ice conditions have been very good for juvenile survival in 2014 and 2015. The Department is monitoring this situation closely, and any increased ice-related mortality this year will be taken into consideration when making future management decisions. 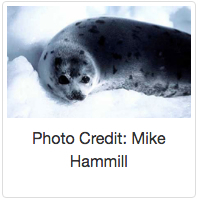 Conservation status in Canada: Harp seals are abundant, with an estimated population of 7.4 million animals and have not been assessed by the Committee on the Status of Endangered Wildlife in Canada (COSEWIC). Size: Male grey seals may reach a length of 2.3 m in length and weigh as much as 350 kg. Females are smaller, reaching 2 m in length and weigh up to 227 kg. Feeding habits and impact on the ecosystem: Grey seals feeds on a wide variety of fish including cod, white hake, flatfish, herring, skate, octopus and lobster. DFO has conducted extensive scientific research, in collaboration with independent scientific experts and the fishing industry, to improve our understanding of the complex relationships between grey seals and other components of the Atlantic coastal ecosystem, including Atlantic cod. While much research remains to be done, the lack of cod recovery in the southern Gulf of St. Lawrence appears to be due to high mortality among larger cod. Predation by grey seals may account for up to 50 percent of this natural mortality, making them a major factor limiting the recovery of this cod stock. The Department continues to study the interaction between grey seals in Quebec and Atlantic Canada and this information will be used to inform management of both the seal harvest and the cod fishery. Reproduction and life cycle: Grey seal pups are born from late December to early February in the western Atlantic. During their two week nursing period, pups double their weight reaching approximately 50 kg at weaning. Within their first month, they shed their white coat, grow dense waterproof adult fur, and soon leave for the sea to learn to fish for themselves. Distribution: Grey seals are found on both shores of the North Atlantic Ocean. In Canada they are found in the Gulf of St. Lawrence off the shores of Quebec, New Brunswick, Prince Edward Island, Nova Scotia and Newfoundland. Population trends: The grey seal population has risen steadily over the last three decades. The total estimated grey seal population size in 2014 (including pups) was estimated to be 505,000 animals. Grey seals in the Northwest Atlantic form a single population. However, they are usually separated into three herds for management purposes based on the location of breeding sites. The three herds are referred to as Sable Island, coastal Nova Scotia and Gulf of St. Lawrence. The Sable Island herd has increased rapidly from approximately 1,300 animals in 1960 to an estimated 394,000 animals in 2014. In the gulf, the population has grown more slowly due to higher mortality among young animals associated with breeding on the pack ice, as well as a greater number of removals from the population. The gulf population has increased from approximately 5,000 animals in 1960 to an estimated 98,000 animals in 2014. Fewer animals are associated with the coastal Nova Scotia herd. In this area total numbers have increased from approximately 1,000 in 1960, to an estimated 14,000 in 2014. Conservation status in Canada: The Committee on the Status of Endangered Wildlife in Canada (COSEWIC) designated grey seals ‘Not at Risk’ in April 1999. Size: Adult males average 2.6 m in length and weigh between 300–460 kg. Females average 2.03 m in length and weigh between 145–300 kg. Feeding habits: The Hooded seal’s diet varies regionally and includes: squid, Greenland halibut, redfish, Atlantic cod, Atlantic argentine, amphipods, euphausiids, and capelin. Reproduction and life cycle: Hooded seals give birth on pack ice during mid to late March. Pups are born with a slate blue-grey coat (blueback) which they moult at about 16 months of age although they may retain the blueback colour for another year. Females nurse their pup an average of only four days, during which the pup doubles in size. Distribution: The hooded seal is only found in the central and western North Atlantic range from Svalbard in the east to the Gulf of St. Lawrence in the west. 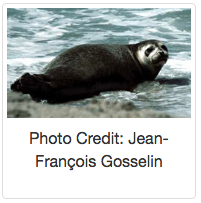 There are two populations of hooded seals. The Greenland Sea population pups on the ice off east Greenland. The Northwest Atlantic population pups at the Front (off the coast of northern Newfoundland / southern Labrador), in the southern Gulf of St. Lawrence, and in the Davis Strait (between Greenland and northern Canada). After the breeding season, Northwest Atlantic hooded seals disperse to feed and migrate to the moulting areas off southeast Greenland. After moulting in July, they migrate along the Greenland coast to Baffin Bay and Davis Strait where they feed before returning to the breeding areas in late winter. Population trends: Abundance of hooded seals is estimated from a population model that incorporates data on reproductive rates, removals and periodic pup productions. Historical trends in abundance of Northwest Atlantic hooded seals are poorly known, but it is believed that the population is at or above historical levels and is increasing. In Canada, the estimated total population in 2005 (last assessment) was 593,500. Greenland Sea hooded seals are estimated to have been reduced to less than 30 percent of their historical numbers with a current population size of approximately 83,000. Conservation status in Canada: The Committee on the Status of Endangered Wildlife in Canada (COSEWIC) designated hooded seals ‘Not at Risk’ in April 1986. Size: The smallest species in the seal family, Ringed seals average about 1.5m in length and weigh between 50–70 kg. 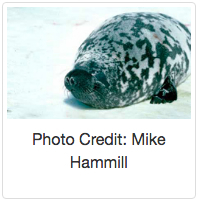 Feeding habits: Ringed seals eat a wide variety of small prey including mysids, shrimp, Arctic cod, herring, smelt, whitefish, sculpins, perch, and other small fish or crustaceans. Reproduction and life cycle: Females give birth to a single pup in March or April. Pups are born in a snow lair where they are protected from the environment and predators. They are weaned after one month. Lifespan: 25 to 30 years. Distribution: Ringed seals reside in Arctic waters and are commonly associated with ice floes and pack ice. 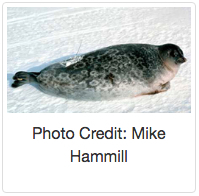 The ringed seal maintains a breathing hole in the ice allowing it to use ice habitat that other seals cannot. Ringed seals have a circumpolar distribution from approximately 35°N to the North Pole, occurring in all seas of the Arctic Ocean. In the North Pacific, they are found in the southern Bering Sea and range as far south as the Seas of Okhotsk and Japan. Population trends: Little is known about the population of ringed seals in the northwest Atlantic. However the North Atlantic Marine Mammal Commission (NAMMCO) estimates that approximately 1.2 million ringed seals would be needed to account for a proportion of the number of seals harvested and killed by polar bears in Baffin Bay. 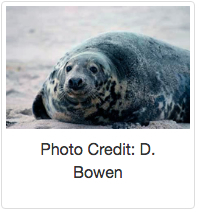 Conservation status in Canada: The Committee on the Status of Endangered Wildlife in Canada (COSEWIC) designated ringed seals ‘Not at Risk’ in April 1989. The COSEWIC Marine Mammal Subcommittee has recommended that there be a new assessment. Size: adults can attain a length of 1.85 m and weigh about 110 kg. Feeding habits: Harbour seals feed upon a variety of fish and invertebrates as available, including sandlance, herring, pollock, cod, capelin and squid. Reproduction and life cycle: Birthing of pups occurs annually on shore. The timing of the pupping season varies with location, occurring in February for populations in lower latitudes, and as late as July in the subarctic zone. Pups are capable of swimming and diving within hours and nurse for three to four weeks, doubling their weight by the time of weaning. Lifespan: 30–35 years for females and 20–25 years for males. Distribution: Harbour seals arefound along temperate and Arctic marine coastlines of the Northern Hemisphere. They are found in coastal waters of the northern Atlantic and Pacific Oceans, as well as those of the Baltic and North Seas. In Canada, they may be found off the coastal waters of British Columbia, Nunavut, Manitoba, Ontario, Quebec, New Brunswick, Prince Edward Island, Nova Scotia, and Newfoundland and Labrador. Population trends: The global harbour seal population is 5-6 million, but subspecies in certain habitats have been reduced or eliminated through outbreaks of disease (especially the phocine distemper virus) and conflict with humans. Populations of harbour seals in British Columbia have been increasing since hunting ended in 1967 and are estimated to number around 100,000 animals. Abundance in Atlantic Canada is unknown but thought to have been reduced due to a hunt and bounty program that ended in the early 1970s. There are an estimated 20,000 to 30,000 harbour seals in Atlantic Canada. Conservation status in Canada: The Committee on the Status of Endangered Wildlife in Canada (COSEWIC) designated harbour seals ‘Not at Risk’ in November 2007. 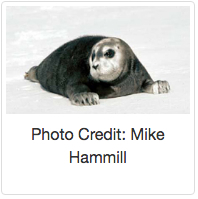 Size: The bearded seal reaches about 2.1 m to 2.7 m in length and weighs between 200-430 kg. Feeding habits: The bearded seal feeds on a variety of small prey found along the ocean floor, including crabs, clams, squid, and small amounts of fish. Its whiskers serve as feelers in the soft bottom sediments. Reproduction and life cycle: In the Canadian Arctic, seal pups are born in May. Further south, in Alaska, most pups are born in late April. Pups are born on small drifting ice floes in shallow waters and enter the water only hours after they are born, and quickly become proficient divers. Pups nurse for 18–24 days, during which time they grow at an average rate of 3.3 kg per day. Distribution: Bearded seals are found in the Northern Hemisphere with a circumpolar distribution that does not extend farther north than 80°N. In Canada, bearded seals are found throughout the Arctic and along the Labrador coast south to northern Newfoundland. Conservation status in Canada: The Committee on the Status of Endangered Wildlife in Canada (COSEWIC) defines the status of bearded seals as ‘Data Deficient’.